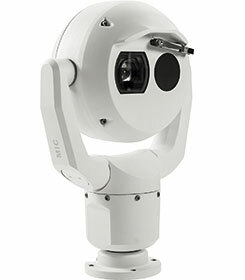 MIC IP fusion 9000i moving cameras from Bosch are designed to perform in practically any environment. They feature an optical and thermal imager in one rugged housing, combined with intelligent video analytics specifically designed for the most demanding environments. This provides full situational awareness and early object detection – even with limited visibility due to smoke, in complete darkness or when objects or people are obscured by foliage. The camera’s unique metadata fusion feature fuses metadata from the camera’s built-in optical and thermal imager. This helps users to focus on ‘invisible’ things that need attention. If an event is detected that is not visible in the video stream being watched, an alarm is triggered anyway, so no matter how tough the conditions, MIC IP fusion 9000i cameras offer full situational awareness, 24/7.